I've seen all the true James Bond films (Never Say Never Again doesn't count), but I still wouldn't consider myself an expert or aficionado. I just like espionage thrillers—which puts me in an interesting situation, because I wouldn't consider some of the Bond movies to really be espionage thrillers. They're more like action movies that happen to feature a spy as the central hero (recently they're beginning to look more like part of the growing superhero subgenre, or even an installment in the Fast & Furious franchise). I tend to think of Connery as the One True Bond, although Craig is shaking things up quite a bit with his turn as 007. I've seen Dr. No before and had quite fond memories of it: in my head, early Bond represents the best of the franchise, when he was still a secret agent and not a dumb action hero spouting one-liners. So I was somewhat disappointed to return to these humble beginnings and find them more humble than I remembered. There's still all the Real Spy Stuff that endeared me to the film when I first saw it: checking his hotel room when he arrives, preparing it before he leaves, all the sort of Just Walking Around And Looking At Things you only find in a true espionage thriller. Attention to detail. There's a popular theory that the Bond movies only ever caught on because Sean Connery looked good walking around exotic locations in a fancy suit. And Connery is still great as the centerpiece: throwing his hat onto the coat rack from outside the door, shamelessly flirting with everyone and everything in sight, yet still capable of taking down the bad guys when he needs to. The seeds for what would become iconic Bond tropes are all here (this one's "cold open" is one of my favorites), even if they still need a bit of watering before they'll really flower. It's just that there are some problems which I find it impossible to ignore. The biggest of these is John Kitzmiller as Quarrel, the local man hired by the Secret Service to assist Bond. He fills an annoying amount of racial stereotypes, running around yelling "Captain!" as if the writers did a Find & Replace for "Massuh!" when they realized how offensive it sounded. Ursula Andress isn't much better as Honey Ryder, the most obviously objectified of all the Bond Girls. At this point in the franchise the movies were still looking at the world through Bond's eyes, and as a result they're less critical of his sociopathic tendencies than future Bonds would be. Still, these issues aside, the film is definitely on the positive end of the spectrum for the Bond franchise. 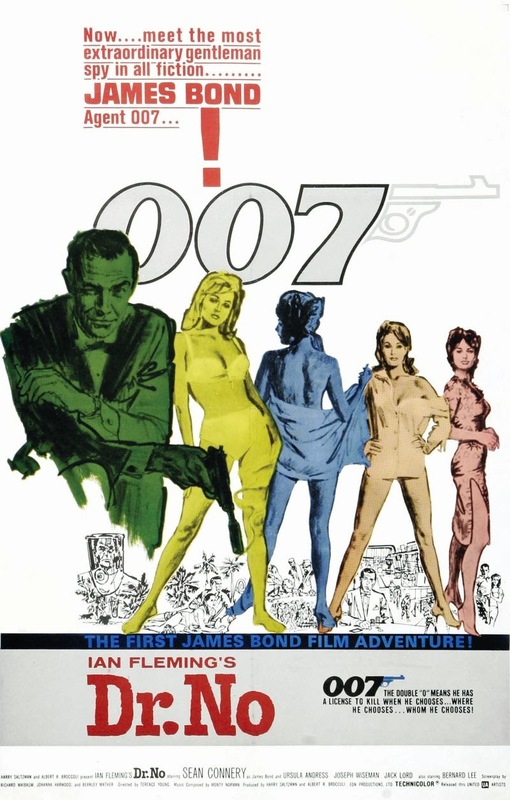 Although it's a bit slower and less refined than some of the better installments, it has its heart in the right place and performs the necessary introductions admirably (the first scene with Bond himself is quite unforgettable). Even if it's not one of the best, it starts the series off on the right foot, and opens the doors for one of the longest running, most successful collections of films in movie history.